Ahtahkakoop’s annual Treaty Day will take place Friday, May 17, 2019 at the Ahtahkakoop Band Hall. The Grade 12 Graduation will take place on Friday, June 14, 2019 at the Ahtahkakoop School. For more information, please call the school at (306) 468-2854. The Annual Cowboys & Indians Golf Tournament will take place on Friday, June 21, 2019 at the Shellbrook Hidden Hills Golf Course. The ACFS Natural Parent’s camp will take place on Friday, June 21, 2019 - Sunday, June 23, 2019. For more information, please contact the Ahtahkakoop Child & Family Services office at (306) 468-2520. The Annual ACFS Family Festival will take place on Thursday, July 11, 2019 starting at 10:00 AM. The Cree Nations Treatment Haven Family Day and Walk a Mile in Her Shoes event will take place on Tuesday, August 20, 2019. The Annual Ahtahkakoop Elder’s Banquet will take place on Friday, December 6, 2019 starting at 12:00 PM. 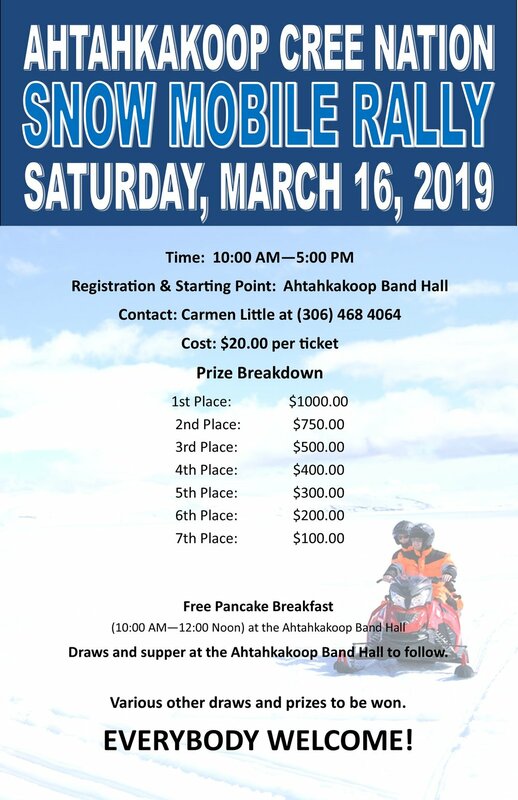 The Baby Bash will take place at the Ahtahkakoop Band Hall. Contact Lisa at ACFS for more details. Contact ACFS for details at (306) 468-2520. The Food Security Meeting will take place on Monday, February 11, 2019 at 1:00 PM at the Band Office Council Chambers. The Saskatoon Urban Christmas Dinner will take place on Tuesday, December 18, 2018 starting at 5:00 PM at the Sutherland Hall, Saskatoon, SK. The Ahtahkakoop-Prince Albert Urban Christmas Dinner will take place on Tuesday, December 11, 2018 starting at 5:00 PM at the Prince Albert Exhibition Centre. BATC will be hosting the annual Community Christmas Dinner on Monday, December 10, 2018 at the Ahtahkakoop Band Hall. The annual Elder’s Banquet will take place on Friday, December 7, 2018 at 11:00 AM at the Ahtahkakoop Band Hall. Interested in Broadcasting, Radio, Journalism? Taking this course will point you in the right direction. ACFS will host their annual "ACFS Natural Parent's Camp" held at the beautiful Waskesiu Lake, SK on June 22-24, 2018. Please contact ACFS at (306) 468-2520 for more details. The Ahtahkakoop Open Golf Tournament will take place on June 16 & 17, 2018 at the Memorial Lake Golf Course (Shell Lake, SK). The Ahtahkakoop School Graduation will take place on June 15, 2018 at the Ahtahkakoop School. For more information, please call (306) 468 2854. The Ahtahkakoop School will be hosting the "Ahtahkakoop Culture Days" at the Ahtahkakoop School on June 4-8, 2018. For more information, please contact Marcy at (306) 468-2854. The Ahtahkakoop School will be hosting a Community Engagement Night on May 30, 2018 at the Ahtahkakoop School. For more information please call (306) 468 2854. The Ahtahkakoop Quad Rally will take place on May 26, 2017 from 10:00 AM until 6:00 PM. For more information, please call the Band Office at (306) 468-2326. The annual ACFS Caregiver's Conference will take place on May 22-25, 2018 at the Travelodge Hotel in Saskatoon, SK. For more information, please contact the ACFS office at (306) 468-2520. Ahtahkakoop's annual Treaty Day will take place on Friday, May 18, 2018 at the Ahtahkakoop Band Hall. Check back later for more information on the day's events. May 14 - 16 - Wiener Roast to wrap up the Village Cleanup on May 16 in the afternoon. The Fred Sasakamoose Hockey Tournament will take place on April 27-29, 2018 in Saskatoon, SK. Exact location to be determined. More information to be provided soon! The Ahtahkakoop School will be hosting the "Ahtahkakoop Culture Days" at the Ahtahkakoop School on April 23 - 27, 2018. The Saskatchewan Indian Winter Games will be held in Saskatoon, SK from April 1 - 7, 2018. For more information, please contact Stanley at (306) 468-2326.